After recently undertaking a back-to-back jajangmyeon and kkanpung saeu shoot-out between VIP and Hsiang Yuen in Artesia (slight edge to the latter), my appetite for Korean Chinese cuisine was rekindled, hence this visit to the Koreatown junghwa yori joint of the moment, Lee's Noodles. 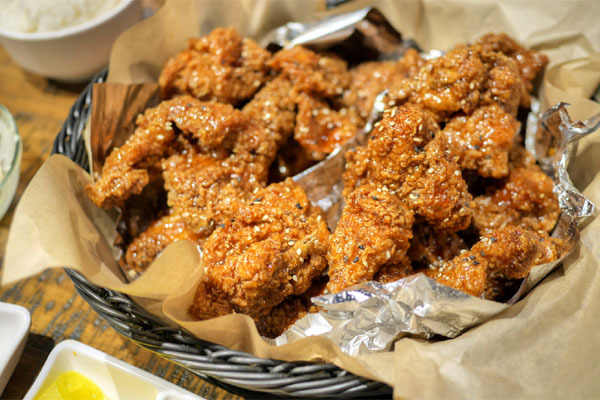 The place actually started out as a chicken-only operation called Kokio back in March, but was flipped by proprietor Deb Kim to Dok Dok a mere month later. 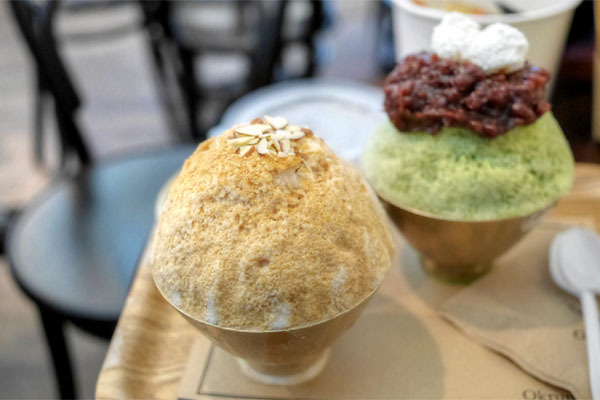 I'm not sure how, but Lee's and the accompanying PAUL Sorbet & Boba sprouted up inside Dok Dok in August, with the owners advertised as the husband-and-wife team of Don Shin and So Young Jin. Lee's takes over the former Vermont Plaza digs of Meedo Dduk Café (and Upper House/Multicell Wireless before that), right next door to the awfully-specific Kimbap Paradise. You have your choice of three separate menus here. 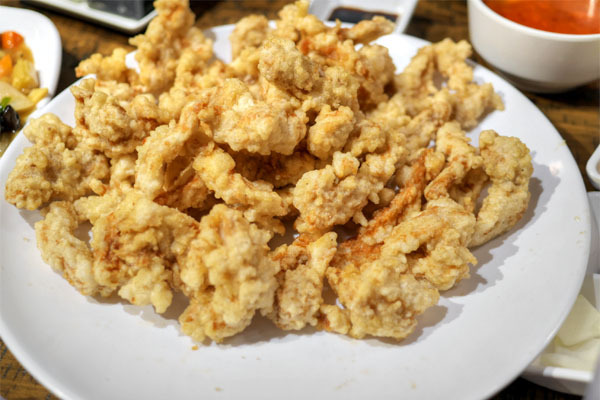 Lee's features a tight array of Korean Chinese standards (note that their namesake jajangmyeon was sold out tonight, ostensibly because it was Pepero Day), while Dok Dok has an even smaller selection of various chicken parts, sauces, and sides (pared down significantly from when it was a dak-only eatery). To drink, PAUL offers a limited array of boba and coffee, but I failed to find any trace of sorbet. Click for a larger version. Standard accompaniments were danmuji (a.k.a. 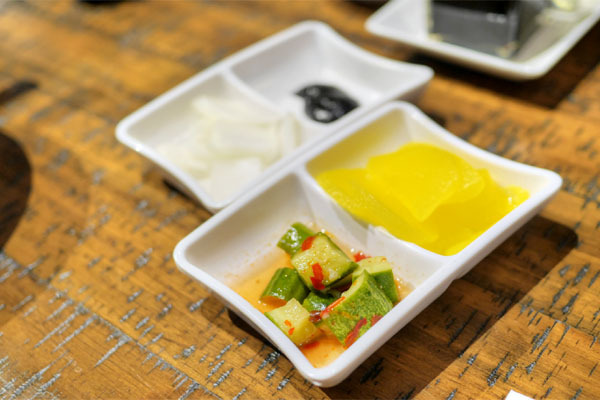 takuan), oi kimchi, and chunjang-yangpa (shards of raw onion with sweet bean paste). 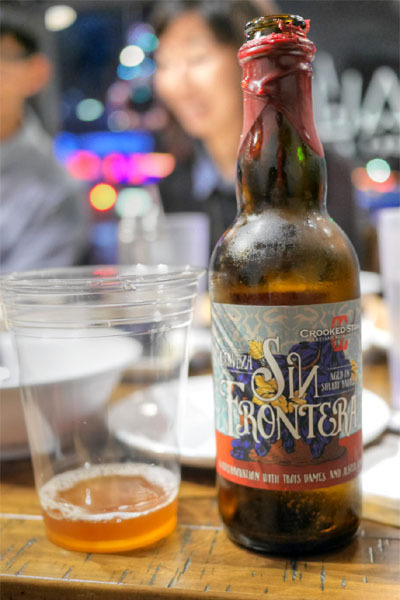 BYOB was seemingly tolerated, and we began with the 2014 Crooked Stave Cerveza Sin Frontera, a sour ale aged in sherry casks brewed in collaboration with Jester King and Trois Dames. I got your expected tart, acidic, funky notes here, but what made this work were the oxidative, oaky nuances from the barrel. 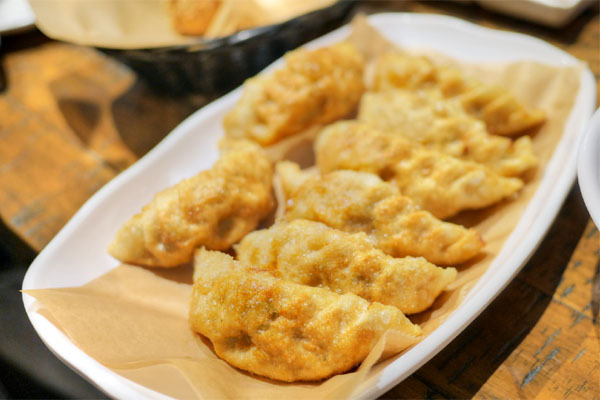 Gunmandu were superb: crisp and savory, with a great bit of herbiness in the filling. I could pop a lot of these. 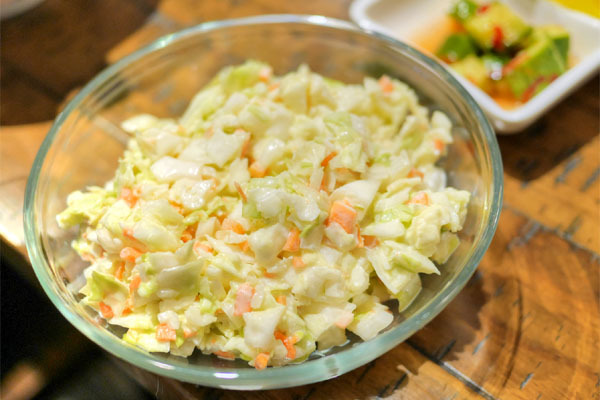 Coleslaw, surprisingly, was another standout, arriving all tangy and creamy and crunchy and slightly mustardy. It was almost KFC-esque, which worked in its favor. 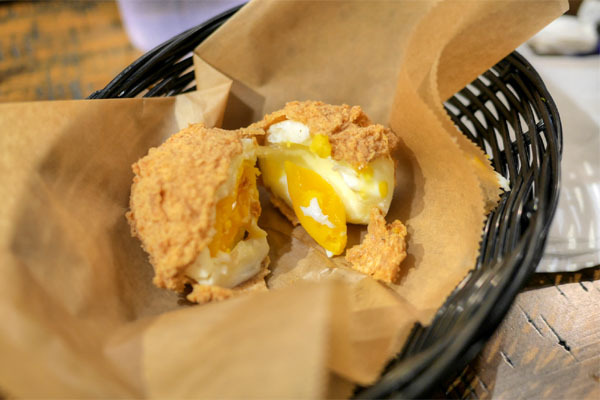 The fried egg was tasty--gooey enough and with a savory, crunchy exterior. 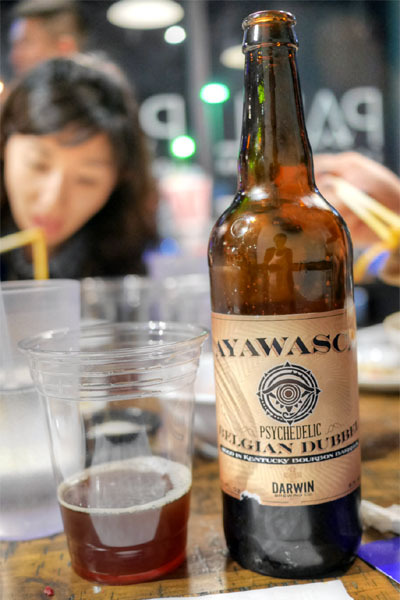 Moving to something heavier now, the 2015 Darwin's on 4th Whiskey Barrel-Aged Ayawasca was a Belgian-style dubbel aged in Four Roses bourbon barrels. I got loads of sweet malt and dark fruit both on the nose and the tongue, with an additional oaky, boozy component showing up on the mid-palate. 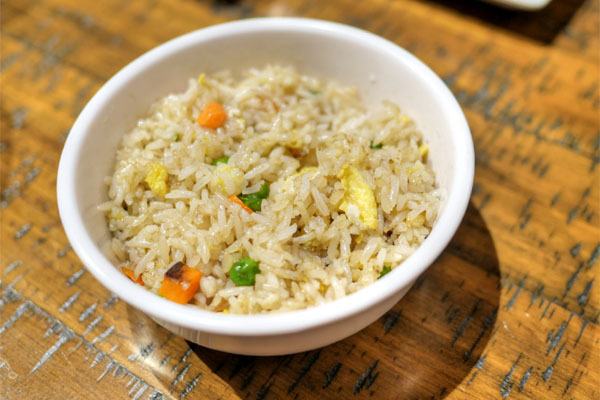 The fried rice was just right, classic in essence with a great charred, peppery taste. 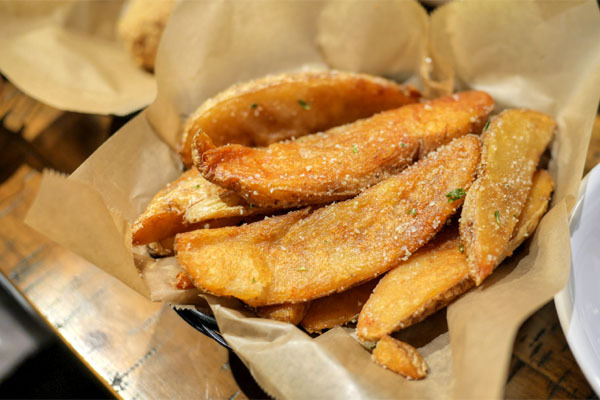 The potato wedges were softer than I prefer, though they had a nice herbiness to 'em that worked. The jjamppong was definitely a favorite. 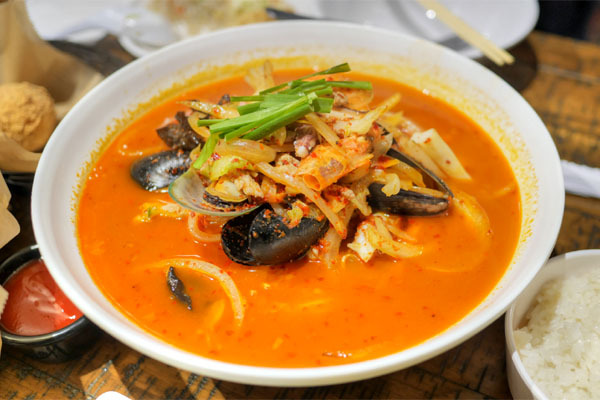 I really appreciated the brine from the sundry seafood here, and how that went back-and-forth with the sharp, piercing heat in the soup. You should get this. 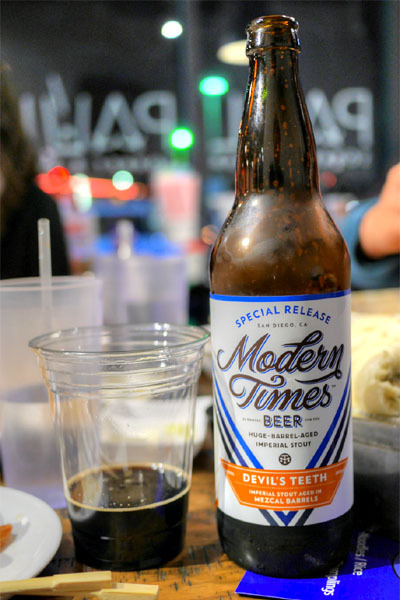 The 2015 Modern Times Devil's Teeth Aged In Mezcal Barrels was sort of an imperial stout/old ale hybrid. 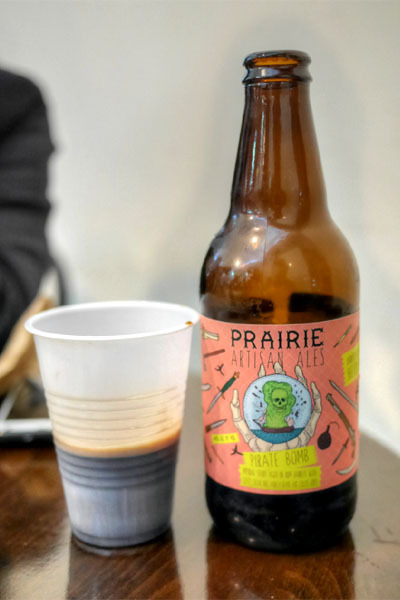 Tons of cocoa powder in the aroma; the taste followed, with initial flavors of rich chocolate and malt leading to a vegetal tanginess and a lingering smoke and booze toward the finish. 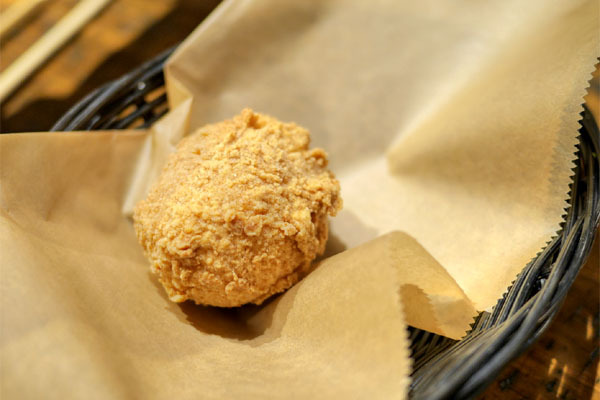 We had to sample the fried chicken of course. The bird itself came out properly crunchy, yet was still tender, juicy on the inside. The "Spicy-Glaze" version was as advertised, delivering a bit of sweetness up front but an almost explosive heat on the back end. It was excessive for me. The "Spicy Soy-Garlic" was more balanced, with a sweet-savory interplay going on that allowed the actual chicken to shine more. Next came the japtang bap. 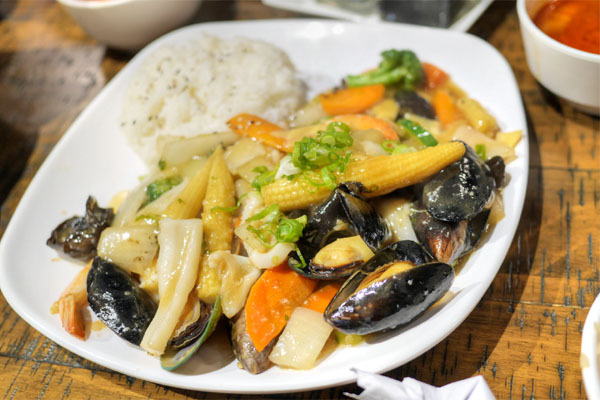 This one also delivered, a comforting dish that did an admirable job showcasing the various types of seafood, all tied together by a delectable Chinese-y gravy. 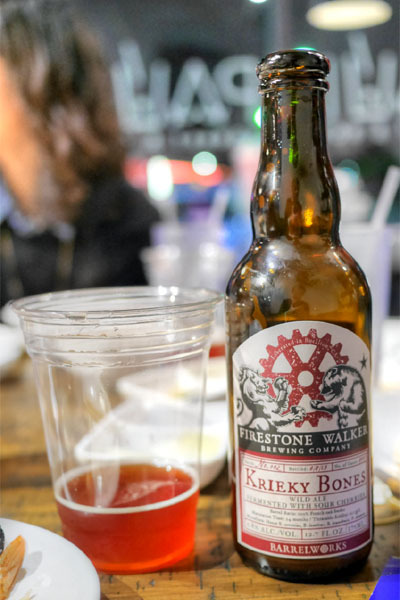 Our final beer here was my favorite, the 2015 Firestone Walker Krieky Bones, a Flanders Red-style ale aged two years in French oak, with sour Montmorency cherries added. I found it lightly fruity, tangy, oaky on the nose, The taste showed off lots of sweet spice initially, which transitioned to more bright, tart, acidic cherry notes as things progressed. 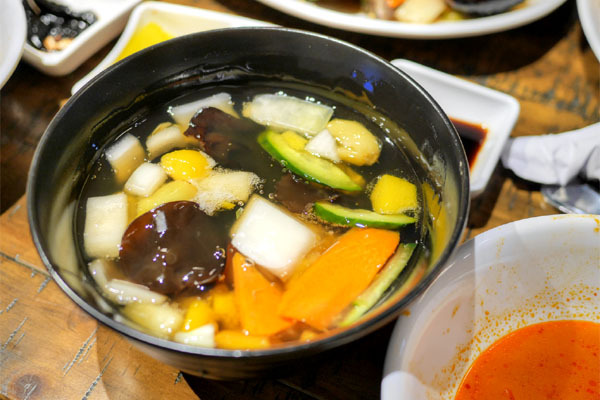 The tangsuyuk was a take on sweet 'n' sour pork. Great texture on the actual meat here, though I found the almost fruit cocktail-esque sauce overly sweet, overly sour for my liking, pretty much masking the inherent flavors of the main ingredient. 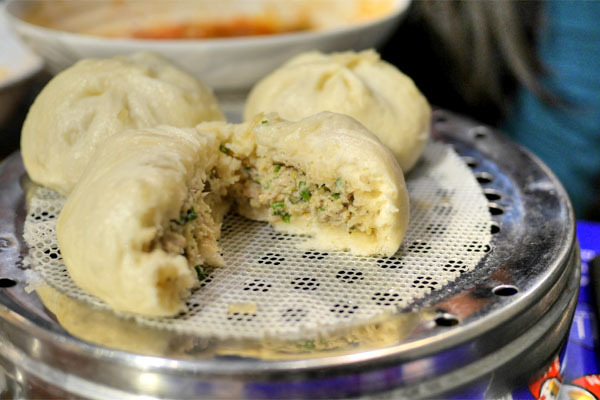 The baozi-like wang mandu were tasty, their stuffing of pork and veggies working well alongside the fluffy buns. I was also happy with the japchae bap. 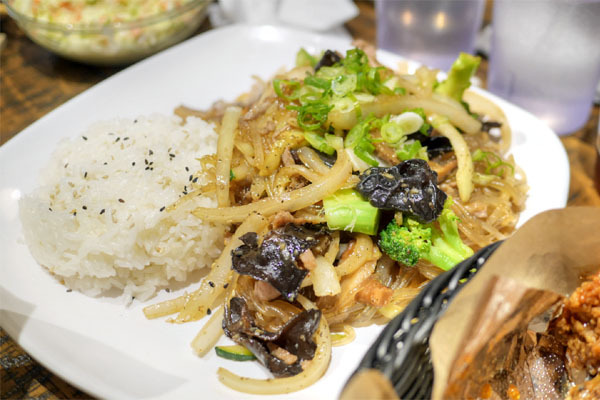 The chewy noodles conveyed a cozy sort of goodness, with the various veggies and mushrooms really shining. Yum. Despite the lack of jajangmyeon, we were quite pleased with Lee's. 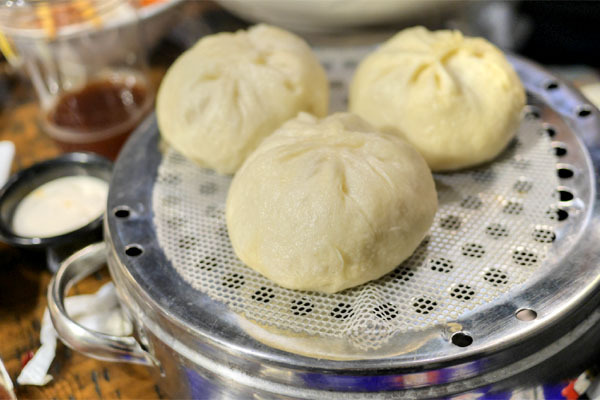 The food's straightforward, but well-made and generally very tasty. It's the sort of place that I could envision myself visiting regularly if I were in the area. 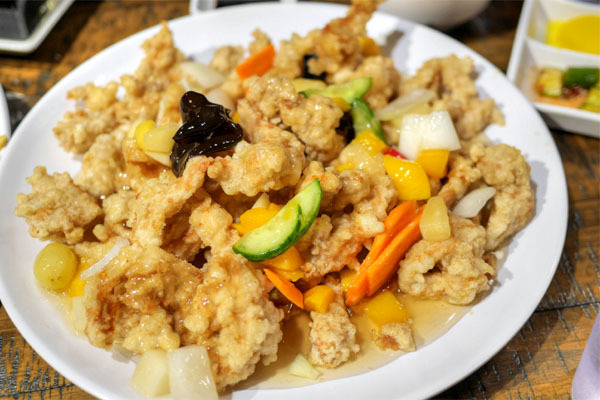 I'd love to see them add some kkanpung saeu to the fray though. For dessert, we headed over to Okrumong for bingsu and to finish off the remaining booze. The first bottle was the 2014 The Lost Abbey Box Set Track #8 - Number Of The Beast, a dark ale brewed with raisins and aged in bourbon barrels with cinnamon and chiles. Think lots of sweet, raisin-y dark fruit as a base, overarched by layers of warming spice. Tasty. Nutty and sweet, but too restrained for my tastes, and lacking in injeolmi. I much prefer the version at Sul & Beans, which just seems to have far more robust flavors and more interesting textures. The 2014 Prairie Pirate Bomb! was very nice, an imperial stout aged in rum barrels with coffee, cacao nibs, vanilla beans, and chilies added. Massive amounts of spice and sugar and vanilla on the nose; tastes of rummy malt, spice, chocolate, wood, which just a trace of heat. I liked this quite a bit more than the standard version of the beer. 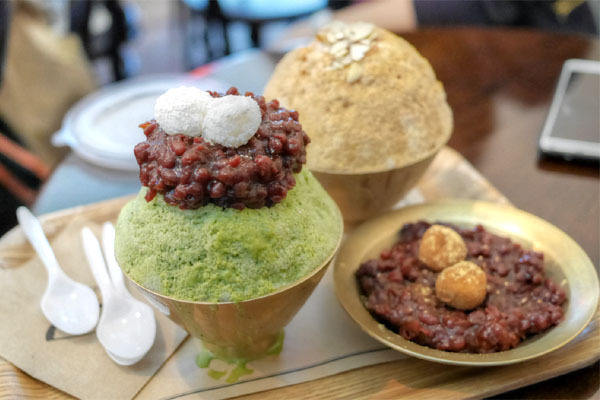 The green tea version was more enjoyable, with a very persistent bitterness that matched up well with the red bean. 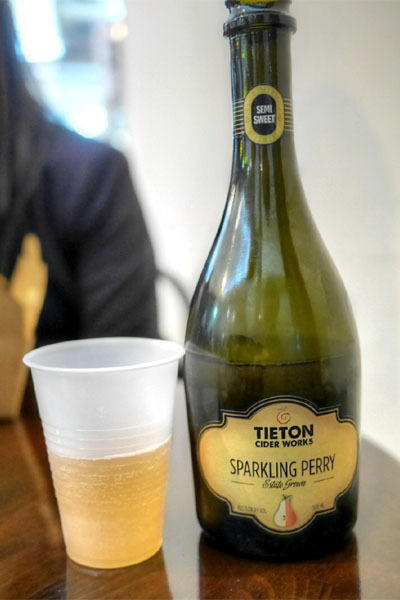 We closed with something light, the Tieton Cider Works Sparkling Perry, an off-dry, refreshing, effervescent pear cider. Tried the jajangmyeon here after reading a lot of good things about it, but it was very lackluster. You didn't miss out on much. 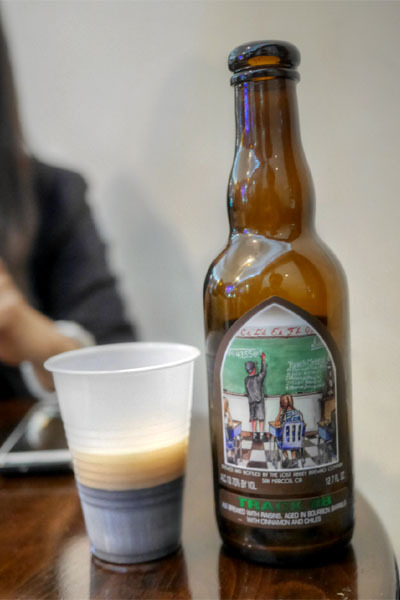 This blog post is now evidence in an ABC complaint against Lee's Noodles, thanks to this weasel phrase: "BYOB was seemingly tolerated"
The least you could do is make clear when you are sneaking in booze without the knowledge of the proprietor or staff. I don't think that makes a difference. The ABC's unlikely to care if he snuck it in or got permission from the resto—they'll fine the restaurant anyway. Seriously, Kevin, stop. You're going to ruin a small business.